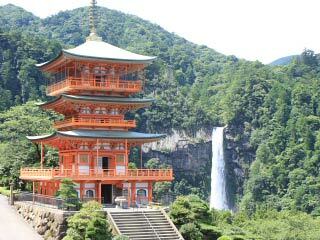 Nachi-Shingu (那智新宮) area is south-western area of Wakayama prefecture. Kumano-sanzan, Kumano Hongu Shrine, Kumano Nachi Shrine and Kumano Hayatama Shrine are located in this area. Historically, this area was considered as the most sublime and sacred place in Japan. Those shrines are registered as UNESCO World Heritage Site. The nature of this area is so beautiful. Especially, there are many beautiful waterfalls. Nachi Great Falls is one of three major waterfalls in Japan, and considered as one of the best waterfalls. Use Hanwa Express Way. Exit at Tanabe. 311 and 168 to Shingu. Use JR Kuroshio Line to Shingu Station.